and daughter Maria V. Kalaw, and Nieves Gonzales and granddaughter Margie Moran. Although this write-up is more for the benefit of the readers of my good friend and fellow blogger, Domz of Kattera, as with my previous article on the inter-relatedness on Filipinopolitical families, this article will work on the same concept. That is, that all famous personalities in the Philippines are related. The other night, my missosologist friend asked me if I could write a brief article on beauty pageants so he could list my Genealogy blog as one of his favorite blogs. Naturally, the first thing to cross my mind was to connect various beauty pageant titleholders to each other. "In 1926, a nationwide beauty search was announced which was generally greeted with enthusiasm. Just as it is now practiced in international beauty searches, the local candidates are pitted against each other until the most beautiful is discovered. This was generally how most of the local Ms. Pageants were conducted in 1926. In Batangas, however, the provincial governor already had a candidate in mind. He then cancelled the search in his province and named Anita Noble from Lemery, Batangas as “Miss Batangas” who was then immediately sent to the national contest. "The candidates for Ms. Philippines attended a tea dance party given by the Bachelors’ Club at the Hotel de Francia along Avenida Rizal, were paraded in the evening in decorated automobiles around Rizal, Escolta, Taft Avenue and ending at the Manila Grand Carnival auditorium at the Luneta. Alighting from the cars, the candidates boarded individual wheeled chariots bearing the name of their respective provinces. Before an adoring crowd and a panel of judges, the candidates were thus presented and voted on. "The regional winners—Misses Luzon, Visayas and Mindanao—proved easy to choose. When it came to awarding the Miss Philippines title there was a tie between Miss Zamboanga (Carmen Fargas) and Miss Batangas (Anita Noble). A more stringent process then followed in order to break the deadlock, with even the president of the Commonwealth, Manuel L. Quezon, joining in the process. Noble and Fargas were even, at one point, asked to wear simple baro at saya without any makeup. Finally, Noble earned the honor of becoming the first Filipina to be awarded with a national beauty title." Anita went on to marry Juan Nakpil, the son of composer and revolutionary hero Julio Garcia Nakpil and Gregoria de Jesus, widow of Katipunan founder Andres Bonifacio. Two of Anita and Juan's daughters became beauty titlists themselves: Annie, who became Ms. Batangas, and Edith, who also bore the title Ms. Philippines in 1955 and would have represented the country in the Ms. Universe pageant in 1956 but decided not to join. Anita's marriage into the Nakpil family also gives us our first connection with another beauty titlist. Juan Nakpil's uncle, Ramon Melecio, younger brother of Julio, had a son, Angel Nakpil, who married Carmen Guerrero Cruz, whose daughter from her first husband, Ismael A. Cruz, was Gemma Guerrero Cruz-Araneta, another first in Philippine pageants. Gemma Cruz represented the Philippines in the 1964 Ms. International beauty pageant held in Long Beach, California. By winning that year's crown she became the first Filipina to win the Ms. International title. True to her heritage, being a Rizal descendant, she apparently donated her $10,000.00 prize to the orphanages Boys' Town and Girls' Home. And then, two of Gemma's first cousins, Paz and Maria Cruz Banaad, married Bienvenido and Roberto Laurel, respectively, relatives of President Jose P. Laurel. It must be recalled that one of President Laurel's sons, Vice-President Salvador "Doy" Laurel, had a dalliance with 1967 Bb. Pilipinas-Universe contestant Pilar Pilapil. Another connection of Gemma Cruz Araneta is through her husband's prominent family. Gemma's marriage to Antonio Sebastian Araneta goes on to connect her further with many beauty pageant winners. A distant cousin of Antonio Sebastian (5th cousin, once removed) is Jorge Leon Araneta, whose wife is Stella Marquez, formerly from Colombia and the first woman to win the title of Ms. International. Jorge Araneta's sister, Judy Araneta, married Senator Gerardo Roxas, whose mother, Trinidad de Leon Roxas, was not only first lady of the Philippines but was also the Queen of the 1920 Carnival of Victory. Meanwhile, Gerardo's half sister, Charo Roxas Moran, was the mother of Margarita "Margie" Moran Floirendo, the 1972 Ms. Universe winner. 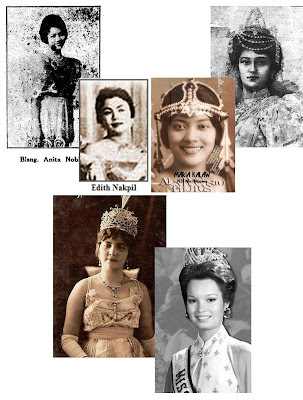 Margie Moran's paternal grandmother, Nieves Gonzales Moran, became the Queen of the Pangasinan Carnival of 1919. Nieves's first cousin, Augusto, was married to the 1916 Manila Carnival Queen, Manolita Barretto. Antonio Sebastian's first cousin is Greggy Araneta, husband of Irene R. Marcos, in turn the daughter of President Ferdinand Marcos and Imelda Romualdez Marcos, herself a winner of several beauty titles such as Ms. Leyte and the Rose of Tacloban. She also was awarded the title Muse of Manila when she failed to win the Ms. Manila title. Imelda's own first cousin, Amelia Z. Romualdez, was named Ms. Leyte of 1927 and went on to compete but failed to win in the Ms. Philippines beauty contest. Imelda's eldest daughter, Imee Marcos, married Tommy Manotoc, whose first wife was Aurora Pijuan, the 1970 Ms. International titleholder. Furthermore, another first cousin of Imelda's was Danieling Romualdez, who married Pacita Gueco whose first cousin was Senator Benigno Aquino, Jr. Ninoy's own mother, Aurora Aquino Aquino, served as one of the princesses in the 1927 Petit Carnival of Concepcion, Tarlac. Ninoy's second cousin was Eva Estrada Kalaw, whose husband, Teodoro Kalaw, Jr., was the son of Pura Villanueva Kalaw, the first ever Carnival Queen in the Philippines. She was named Queen of the Orient in 1908, to distinguish her from the Caucasian beauty that was also named Queen of the Occident. Pura's daughter Maria Kalaw would later follow in her footsteps and be crowned 1931 Ms. Philippines. Finally, Ninoy Aquino's marriage to Corazon Cojuangco goes on to relate the Aquinos with the Cojuangcos, whose one member, Eduardo Cojuangco, Jr., was Cory's first cousin. A son of Eduardo Jr. is Carlos "Charlie" Cojuangco whose wife, Rio Diaz, was a younger sister of Gloria Diaz, the first Filipina to win the title of Ms. Universe. Of course, it is quite obvious that the beauty queens of yesteryear were connected in one way or another. Just like politics, beauty pageants in the past were not as democratized as today and only the well-born and the daughters of the elite competed or were chosen to be contestants. Regardless, in the end, just like everything else in the Philippines, beauty pageants and pageant winners have proven to be a family affair.